The AURORA 40 is a with a classic Trumpy yacht style. She was originally designed as a tender for a resort island in Naples, Florida, and to be used for sunset wine and cheese cruises in the evenings. Her construction is modern composite plywood and epoxy, aluminum, or steel. The first hull was built by Preservation Shipyard in Haverhill, MA with CNC cut hull frames and panels by Seaside Small Craft in Willis Wharf, VA. She is a quick build in stitch and glue construction. 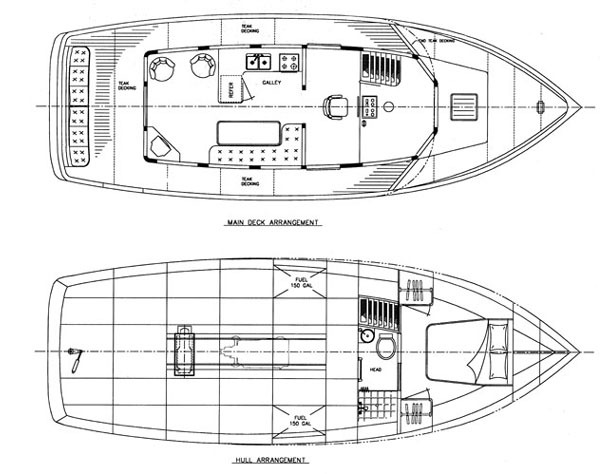 Scantlings have been approved by the USCG for passenger service. Purchase and Download Study Plans for the AURORA 40 for $5.00 in PDF format (zipped file).